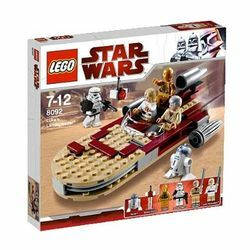 8092 Luke's Landspeeder is a classic Star Wars set released on January 10, 2010. The set's main feature is the small, hidden compartment at the rear of the speeder used for storing the Jedi's Lightsabers. This set is Limited Edition and a Wal-Mart exclusive in the US. The speeder is small in size, comparable to the Republic Snow Speeder in the set 8085. The design is not symmetrical, as the left engine is missing its housing. The speeder itself seats two minifigures, and for controls, the landspeeder has a single steering wheel. At the back, the top engine and the small platform that it rests on, can be removed to reveal a hidden compartment used for storing the included lightsabers. It is functional, albeit small, and requires the blades to be removed from the hilts before the weapons can fit within the compartment. Of the six minifigures included in this set, four are exclusive. Luke Skywalker was previously available with this design in the 2008 set 10188 Death Star, but is only available with pupils printed on his face here. The same goes for Ben Kenobi, who also has a slightly redesigned face. Both come with blue chrome-handled lightsabers. The Sandtrooper features a new, black shoulder pauldron and a new backpack, unlike the standard Sandtroopers which only have an orange pauldron. 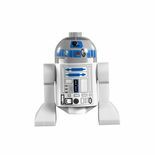 This is one of the least expensive sets which include the new R2-D2 and C-3PO. The Sentry Droid is entirely brick-built, and features a clear stand to appear as if floating or flying. Luke's landspeeder was a civilian X-34 landspeeder manufactured by SoroSuub. The speeder featured holographic displays, a computer for navigation, and many repulsorlift counterbalances for a smooth, easy ride. The speeder had no weapons mounts and retailed for roughly 10,500 credits. The X-34's average altitude during travel was about 10 cm above the surface of the planet. Luke purchased his speeder from Jabba the Hutt. Interest in the X-34 waned when SoroSuub released the newer, sleeker model, the XP-38 landspeeder. Luke Skywalker sold his old X-34 for 2,000 credits in order to pay the fare for Han Solo to fly him and Ben Kenobi off Tatooine in the Millennium Falcon. This set is a LEGO Shop and Store exclusive, and Wal-Mart exclusive in the US. This set is available as a Limited Edition if it is purchased from LEGO Shop.com, LEGO Stores, or Wal-Mart. This is a description taken from LEGO.com. Please do not modify it. (visit this item's product page) Adventure on Tatooine…where it all began! When he drove the old hermit Ben Kenobi into Mos Eisley spaceport, young farm boy Luke Skywalker had no idea that he would end up becoming a Jedi Knight and saving the galaxy. Recreate the moment the adventure began with this special-edition set, featuring an all-new landspeeder vehicle with a secret lightsaber compartment, a cast of droids and heroes, and a sandtrooper guard with a security droid. Are these the droids he’s looking for? Facts about "8092 Luke's Landspeeder"